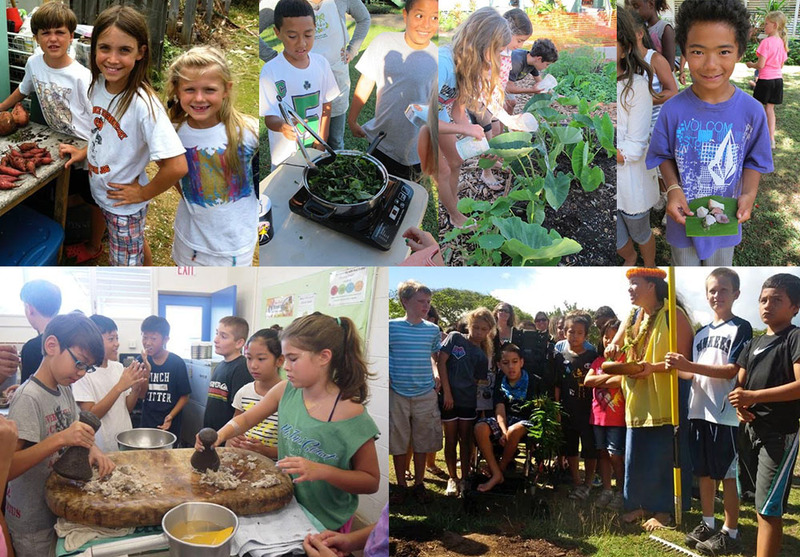 Makahiki season is in full swing and the ‘ĀINA in Schools Hawaiian Garden curriculum is more relevant than ever, teaching 4th grade students in 16 public schools about the importance of Hawaiian staple foods from a cultural, historical, and nutritional lens. Beginning with kalo (taro) planting in early fall, the eight lesson, standards-based garden curriculum covers Hawaiian plant staples including ‘uala (sweet potato), ‘ulu (breadfruit), ki (ti), and mamakai. Students learn about the essential role of the mahi’ai (farmers) in society as they themselves become engaged with the land and learn to propagate, care for, and harvest Hawaiian plants. In addition, students are encouraged to reflect on Hawaiian values and mindfulness through vocabulary words, mele (singing), and oli (chanting). Beginning the year connecting the ahupua’a to community health, students are able to link their physical, mental, and social practices in the garden to sustaining themselves, their peers, and the environment. Considered the most important staple of the Hawaiian people and one of the early canoe plants that sustained voyagers across the Pacific, kalo is a particularly engaging plant for students. From small, shriveled huli (cuttings) to robust hā (stems) with vibrant lau (leaves), the kalo’s transformation grows the students’ fascination and investment over time. They weed, mulch, and water with reverence, proudly pointing to “their” kalo despite gentle reminders that the plants belong to everyone. In some schools, the Hawaiian Garden has extended beyond ‘ĀINA lessons. With the help of a number of dedicated chefs, ‘ĀINA in Schools also facilitates ‘ĀINA “Chef Visits” where chefs from a wide range of backgrounds engage elementary students in Agricultural Literacy, cooking skills and mindful eating. Some chefs like Gigi Miranda and Mark Noguchi have made efforts to integrate Hawaiian staples in their cooking, often with a modern twist. At Ka’a’awa Elementary, students devoured Chef Gigi’s ‘ulu banana bread pudding while at Waikiki Elementary, Chef Noguchi and his wife Amanda demonstrated tradition ku’i (taro pounding) followed by a tasting of delicious pai’ai truffles. With some projections estimating that over 90% of food in Hawaii is imported, returning to indigenous staples and working towards food sovereignty are crucial to the next generation. In addition to supporting local farmers and reducing food miles, recalling staples like kalo and ‘ulu are a means of cultural preservation, rich with history and beneficial nutrients. As we celebrate the harvest months of Makahiki, it is important to remember the agricultural legacy we have inherited and to preserve the practices of those before us for the generations to come.